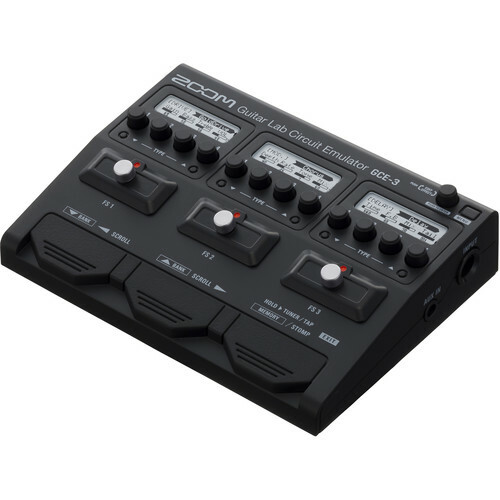 Designed for guitarists who record on the go, the ZOOM GCE-3 is a pocket-sized, bus-powered interface that provides many different guitar tones accessible and editable right form the unit itself. The 32-bit DSP housed within the GCE-3 handles all the tone-sculpting for your tone, so your computer doesn't have to do the work with plug-ins of amp simulations, EQs, compressors, and effects processors. You'll also note that you can record to your computer without any noticeable latency with the GCE-3. This interface connects to your computer over USB-C. In the box is a USB-C to USB-A cable so the GCE-3 can work with conventional USB ports. With the AUX input, you can route backing tracks into the headphones while recording only the guitar part to your computer. Change your monitoring volume from the device itself, thanks to a dedicated volume control. When you pair the GCE-3 with the ZOOM Guitar Lab app, you'll have access to the same tones you'll find in all ZOOM G-series pedals. You'll even have the ability to download constantly updated patches through the NEWS section of the app. The app is compatible with Mac and Windows platforms. A nonslip pad is included along with a license of Cubase LE for recording and editing your guitar. Box Dimensions (LxWxH) 8.7 x 4.35 x 1.75"
Can the GCE-3 be used without the computer? Will it retain &quot;patches&quot; so it can be used &quot;live&quot; without a computer or is this merely a hardware controller for guitar lab? The GCE-3 is capable of internally storing one patch for use without a computer.